It was the last Friday when I I called my house-help from office. I requested her to soak a cup full of Kalai Dal (Dhuli Urad Dal) for around eight hours. I had a plan to make Bedmi Poori which requires soaked Urad Dal to make the stuffing. Can you find anything wrong with this? Believe it or not, I have not found any until I reached home! Well, I forgot to tell her the size of the Cup and she ended on using a coffee mug instead of a 150g cup to measure the lentil! Basically, I had a big fat casserole filled with soaked Urad Dal which could be used in making more than 50 Pooris! Needless to say, I did not use entire dal to make the Poori. I used half of the same to make Sukhi Urad Dal next day! 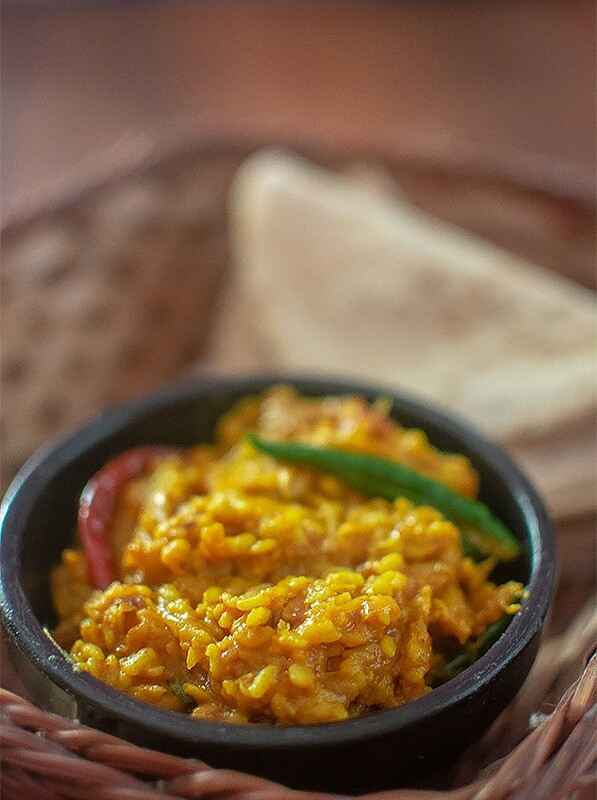 A North Indian delicacy, Sukhi Urad Dal goes amazingly with Roti! However, I am not much regular to make this particular version of Dal at home. All of us at home prefer to have Urad dal aka Kolai dal in Bengali way which is nothing but Bengali Korai Dal along with Aloo Posto. However, that recipe does not call for soaked Dal and hence I had to make something different with the soaked Dal. Talking about the recipe of Sukhi Urad Dal, it calls for a few basic ingredients apart from the lentil. Some chopped onion, ginger and garlic paste along with a few spices are what you need to make this vegetarian side dish. Make sure to soak the lentil for more than 8 hours in water. Another important thing is the process of pressure cooking the Lentil. As the name suggests, the end product must be “Sukhi. By the way, before going further with the recipe of Sukhi Urad Dal for which you are at this moment reading my blog I have a question for you. Do you only read the recipe when you read my blog or you read the bathroom stories I write? Actually, a social media post by an acquaintance made me intrigued. According to her, a recipe blogger must not write bathroom stories or family Tell-a-tale while writing the recipes. I was a bit surprised as I found a few people supporting her. As an avid reader of recipe and food blogs and websites, I do enjoy both recipes and the stories. There are several brilliant blogs where they write only the recipes and there are websites where they share a few pages from their daily life along with the recipe. I fall in the latter category, however, I enjoy both the types when it comes to reading. I feel it is up to the writer how to express! Isn’t it? However, the reader’s view is equally important and hence this question. I would love to know what do you think in this regard as a reader of a recipe blog? 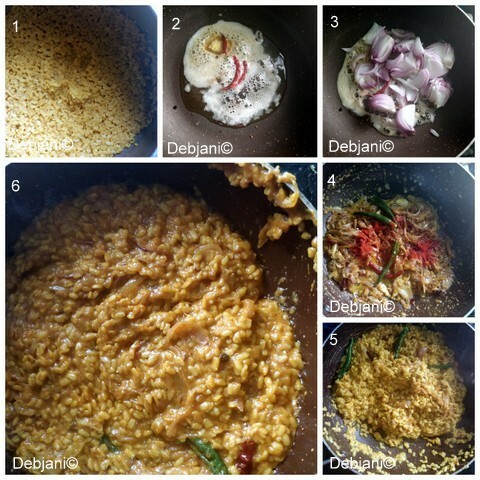 Here’s how I make Sukhi Urad Dal at Debjanir Rannaghar! Sukhi Urad Dal is a dry lentil based vegetarian side dish from North India. This goes amazingly well with Roti or Paratha. Amchur Powder/ Mango powder: 1 Tsp. Soak Dal overnight or for eight hours using fresh water. Discard the water and wash dal under running water 2-3 times. Now take Dal along with half of the turmeric powder and also ½ tsp. salt in a pressure cooker. Pour water and cover the Dal. Do not use excess water. Put the lid on along with the weight. Cook over a medium high flame for around 5-6 minutes or two whistles. Switch the flame off and open the lid once the pressure drops completely. Check the Dal, There should not be extra moisture inside the cooker and the dal must be cooked properly. Pour ½ Tsp. Oil over the Dal and using a spatula lightly fold the dal and keep it side without covering the cooker with the lid. Heat Oil in a pan in the meantime and temper the oil with Dry red Chili and Asafoetida. Add chopped onion and cook till the onion turns translucent in color. Now add Ginger paste, garlic paste and also green chili and cook till oil comes out from the mixture. Add rest of the turmeric powder, Cumin Powder, Coriander Powder, Amchur Powder/ powder and also salt and cook for 2 minutes. Now add boiled dal and give it a light mix. cook over low flame for around 5 minutes or until the moisture evaporates completely. Do not mix much as that will lead to a soggy mixture. Once properly cooked, add Garam Masala Powder and lightly fold. Serve Sukhi Urad Dal hot with Roti or Paratha or Rice. You may replace mustard oil with any other oil. 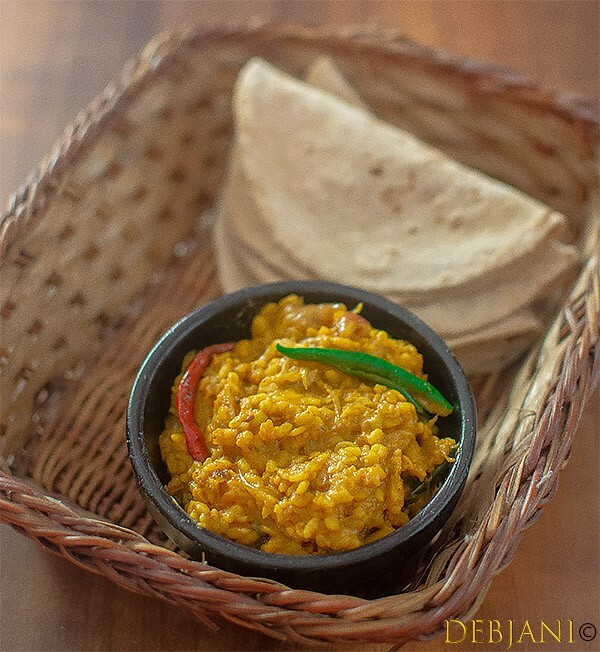 Have you tried the Sukhi Urad Dal recipe from Debjanir Rannaghar!